Yeah, Thornton was the one who mentioned it, but it’s Brodie’s story and I’m not about to argue with our Captain. Anyway, it’s my understanding that these particular boards are being used in a lot of arenas this season. I even wrote a little post about it a while back. In short, the “lively” factor is likely to show up all around the NHL. Maybe the bouncy boards won’t be so ubiquitous as I thought. 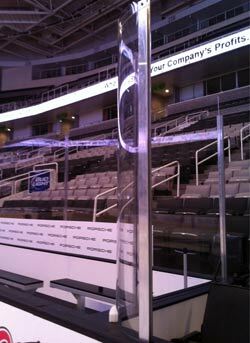 I thought the pictures of the new curved glass by the benches were pretty exciting. I’d heard talk about it, but I couldn’t quite visualize which way it would be curved. Thanks to SJ Sharkie for tweeting that pic. It isn’t quite like clothing all the players in bubble-wrap, but it looks softer than a steel post. I’m torn over the fact that Burns will be playing tonight. Of course “yay!” is the proper response, but tonight is the only preseason home game I won’t be going to. I was offered tickets but I have spent too much time in San Jose lately and, much to my amazement, I turned them down. There’s dust on the stove top and I think my house has been listed as “space available for haunting, spectral pets ok.” Tomorrow will be soon enough to go back. I was curious to see the lines that Pollak tweeted this morning, expected in the game tonight: Marleau-Thornton-Pavelski, McGinn-Handzus-Mitchell, Winchester-Desjardins-Murray, Mashinter-Wingels-Connolly and Murray-Boyle, Burns-Irwin, Pelech-Moore. True, it’s all still experimentation but I think it is interesting to see Mashinter singled out of the 3M line he’d been with in practice and Anaheim. I don’t think it’s terribly significant, just curious. Wingels and Connolly were on other lines too. Hardly surprising. Well, maybe I was a little surprised to see Andrew Murray in that group. Maybe the grouping doesn’t mean anything. I didn’t list the goalies because, except for Greiss who was with Group 2, I didn’t make a note of who was with which group. Until I see Niemi out there again I’m holding my hands over my eyes on the subject of Sharks goalies. I already freaked out about this back when I noticed Nitty wasn’t skating in Captain’s Practices. No offense to Greiss, but he hasn’t given me a lot of reason to feel better about this, and I still don’t think he will get much playing time once Nemo does come back and 12 weeks (10? 9? whatever) is a really long time for Nemo to play all by his lonesome… right, I said I wasn’t going to think about that. Being positive, even if coverage of these exhibition games is limited, at least Sharks are playing other teams, and some of the guys are sending out pre-game and post-game tweets. It’s almost like the real thing. October is only 8 days away, I can smell it.